Nestled right on the beach with spectacular views of the beautiful coastline, Qunci Villas are pure luxury. With an abundance of cocktails, palm trees and swimming pools wherever you look, it's the ideal setting for a wedding you'll never forget. Do Not Disturb: A beachside wedding with friends and family, a private dinner for two on the beach, a wedding night bedroom decorated with flowers of your choice and your own personal pool as well as a late lover's breakfast the following day. I Do! I Do! 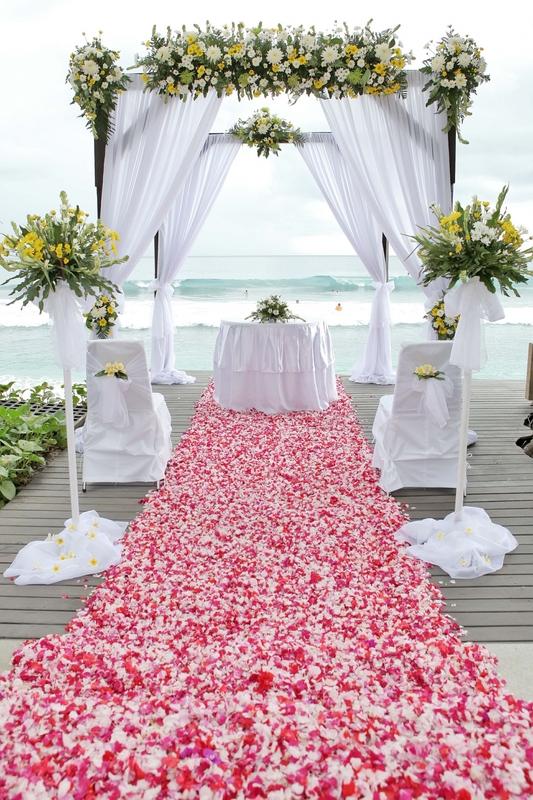 : A tropical ceremony on the beach plus a honeymoon to remember. The wedding planners ensure that family and friends are provided with fun activities so you can spend time alone. The package includes a four course meal under a gazebo on the beach, a lavish candle and flower display in your room, a lover's breakfast in your private villa as well a reception party for your friends and family. Make Me Crazy: This package includes a stay in the three bedroom Qusia Villa, a lavish cocktail party after the ceremony in the villa, and a reception dinner and festive parade on the beach, all documented by their in-house photographer.